The current Venezuela crisis is affecting millions of people. Galloping inflation has created an economic free fall that has decimated spending power, employment, and future opportunities. Economic migration is on its way to surpassing the Syrian refugee crisis. People are having to make tough choices about what to buy and whether they should migrate to look for work. This is roughly 10 percent of the Venezuelan population (figure from Consultores 21). This rate of inflation between May 2017 and May 2018 has created an economic crisis affecting spending power and employment opportunities. In Venezuela today the economic crisis is so bad that many people have left the country. Professionals and youth are leaving en masse, leaving behind a country made up of the most vulnerable people — children and the elderly. Each departure rips apart communities and families. These are the stories of those left behind. Five of María Teresa's children have left Venezuela. "It makes me want to cry"
The national flower of Venezuela, an orchid, has been flowering for six months in her garden. They usually only bloom one month a year. Barefoot Carmelite Priest Father Cristobal Dominguez has seen a mass exodus of youth from his parish as a result of economic migration. Fr. Cristobal’s parish works closely with Caritas Venezuela to give people hope and provide nutritional support for those in need. Each week his parish serves more than 500 people with the “olla comunitaria,” (the communal pot). He recently started a second feeding on Fridays for the teachers, staff, and their families, at the Church school. He fears that come next school year, many of the teachers will join the diaspora. 17 Youth Ministry members have left this parish. Fr Cristobal worries that more parishioners will have to migrate. Naile, Naiberli, Naire's mother is working in Colombia. Their grandmother, Maribel, looks after them. A month a go Maribel Pérez’s daughter went to seek work in Colombia. Now she looks after her three granddaughters, Naile, 12, Naiberli, 7 and Naire, 13. Maribel says its a struggle to keep her granddaughters fed. One of the girls is asthmatic, and she doesn’t have the means to buy an inhaler on her retirement pension. School enrollment is approaching, and Maribel isn’t sure she can afford the ID photos required. If she doesn’t get the images taken the girls won’t be able to go to school. María and Jesús' daughter is now studying in Mexico. Their daughter "didn't even earn enough to buy a piece of candy". Dr. María Alarcón and Jesús Rodríguez have a daughter who is now working towards a doctoral degree in anthropology in Mexico. “She was working here, but she didn’t even earn enough to buy a piece of candy,” says her mother. The couple volunteers for Caritas Venezuela. María provides medical care and Jesús assists with the weekly soup kitchen that serves over 500 people. María Eugenia and Junior couldn't afford to live in Venezuela. Their mother found their departure "really painful". Magaly Henriquez, 58, is the mother of five children. Her two youngest emigrated to Peru. 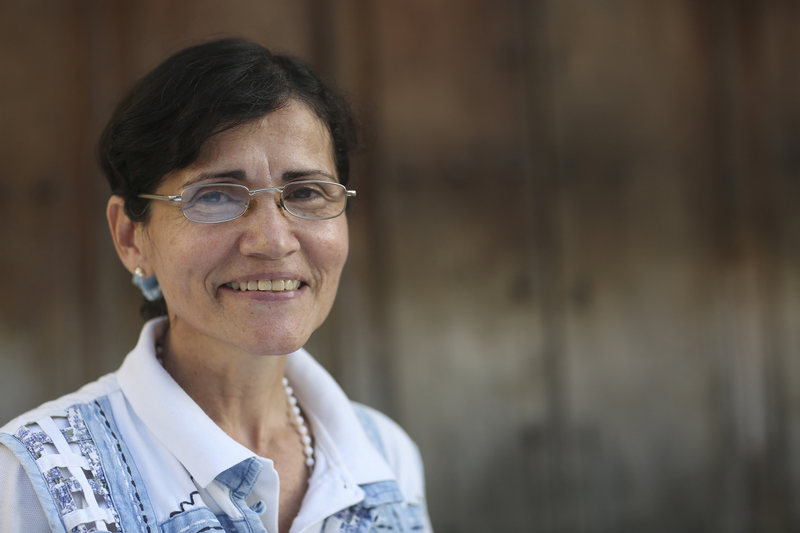 Yusmarely lives with her three children in Venezuela. Galloping inflation has decimated Venezuelan spending power and Yusmarely is struggling to feed her family well. Each day the prices inch up. What she pays for a kilo of eggs today might double in price only a few days later. Like most mothers across Venezuela, Yusmarely is forced to juggle meals, strategically deciding when to feed her children so they feel the least amount of hunger. Watch this video to see how Caritas Venezuela has helped Grendimar and her brother Greivis to avoid malnutrition and start regaining and healthy weight. Yusmarely’s 7 year old daughter Valentina eats a bowl of rice with bits of ground meat. – Yusmarely Acuña, mother of Greivis, 3, Grendimar, 6, and Valentina, 7. The impacts of the Venezuela crisis are far-reaching. High inflation means it’s difficult for people to buy food, medicines and even soap. This had led to an increase in hunger and illnesses, especially among children. Common illnesses which could have been treated with home remedies can develop into life-threatening problems because people’s defenses are weakened by under-nutrition. 14 percent of children under 5 monitored by Caritas Venezuela are showing signs of acute malnutrition. This is a time when doctors are needed more than ever. But healthcare staff, including over 20 percent of doctors, have joined the exodus of Venezuelans leaving the nation. However, 20,000 new Caritas Venezuela volunteers are stepping into the breach. 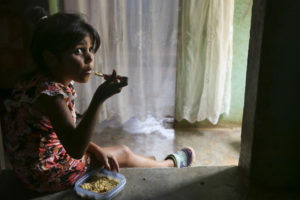 They have joined what Caritas Venezuela director Janeth Marquez calls an “opportunity to save the lives of 300,000 children.” They are providing food, health care advice and nutrition supplements. Here are stories about just three of these inspirational volunteers. 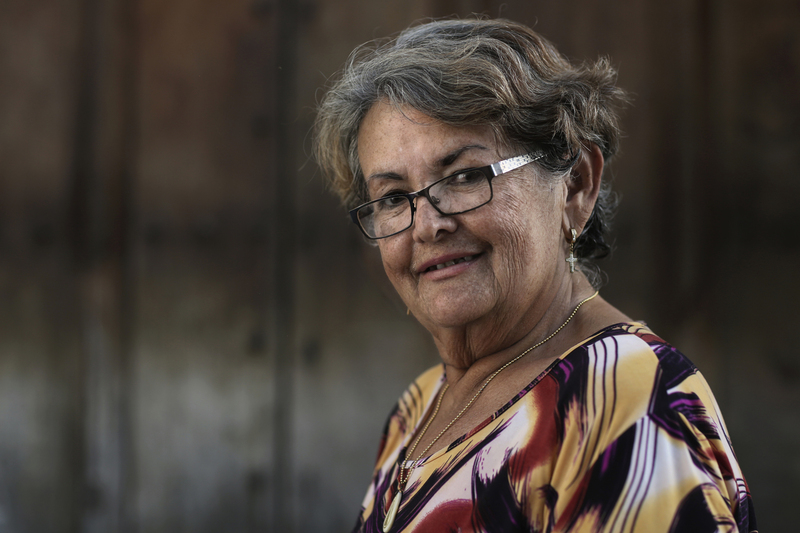 In each child she sees at the clinic, volunteer Dr. Luisa Carlotta Castillo sees the reflection of her 15 nieces, nephews, and grand-nephews, many of whom now form part of the Venezuelan diaspora. She measures the height, weight, and arm circumferences of children and babies who are brought to see her. Many will be suffering from under-nutrition. But Dr. Castillo is pleased to be able to help parents and carers tackle this problem by providing them with sachets of strawberry-flavoured nutrition powder . Fr. 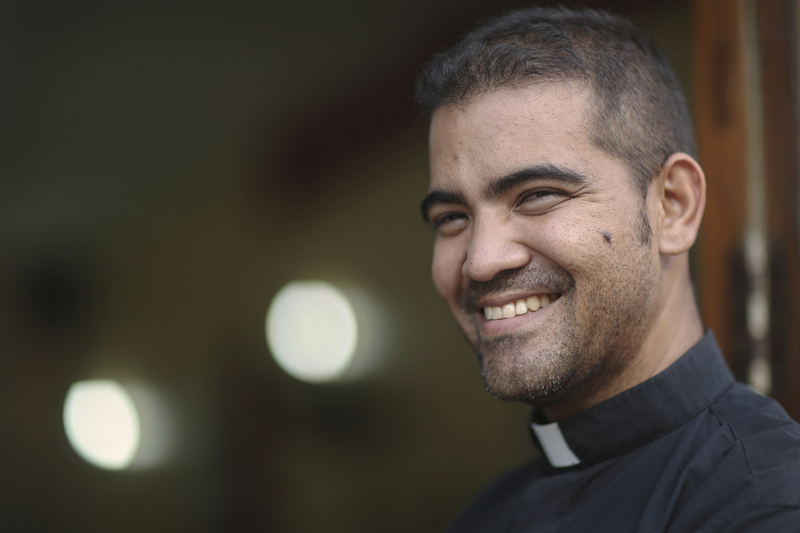 Alvaro is a parish priest and director of a diocesan Caritas chapter in Punta de Mulato. He has seen the crisis in Venezuela cause problems across his diocese. In order to help, Fr. Alvaro started an ‘olla comunitaria’ (community pot) that provides soup vulnerable people like children and the elderly. It recently increased its frequency from one day to three days a week. As the need increases, so does the number of local Caritas volunteers. The original small group of 5 has grown to over 500. Fr. Alvaro says this shows that, although life is difficult for many, people are not ready to give up. Caritas volunteer Dr. Rosas is concerned about hygiene in Venezuela. A bar of soap costs 3 million bolivares, more than half the monthly take-home, making it a luxury relatively few can afford. A lack of soap can easily lead to skin infections and stomach problems. If a child suffers from diarrhea they can quickly lose any weight gained on the nutrition programme. Watch the photo gallery below to see how children and vulnerable people are getting help from Caritas Venezuela volunteers. Genesis, 17, has seen her weight go up 6 kilos from a low of 22 kilos by taking nutritional supplements. Baby Neyger has gained 1.7 kilos since he started on the Caritas nutrition programme. Caritas volunteers prepare soup for 500 people at an 'olla comunitaria' (community pot). Three year old Ricardo is weighed by Caritas Venezuela volunteers to check he is gaining weight. Six year old Grendimar drinks a nutritional supplement. Aflredo, 16 months, and Yandreli, 5, take nutritional supplements. Yondri, 22, also has supplements to help with milk production. A volunteer measures Gabriel's arm to check his growth. This 'olla comunitaria' (community pot) started off serving 40 people but now feeds more than 500 a week. Ricardo, who has been receiving nutritional supplements, and his brother Yonaikel, add fresh mangoes to their diets. Support the Caritas volunteers who are providing food and nutritional supplements to the most vulnerable people in Venezuela.